Since it’s inception in 1906, the collegiate system has insisted on keeping its athletes amateur, forcing student athletes to rely fully on their scholarships to get them through their college days. The ideal of amateurism may have started with the best intentions, but in the past 10 years, it has caused severe consequences for some of the NCAA’s biggest programs and players. Most recently the NCAA’s best returning player, Johnny Manziel, faced an investigation for allegedly receiving payments for autographs he signed, an action that could have potentially forced him to sit out the entire upcoming season. After a six-hour hearing, the NCAA determined that there was no evidence that Manziel received payments for autographs, but he did violate rules regarding the signing of certain autographs and declared him ineligible to start the season for one half of the first game. 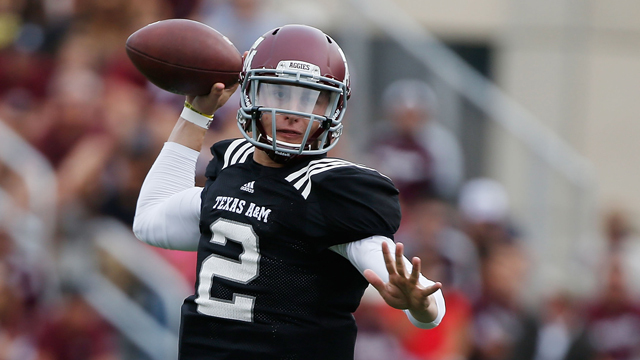 “Student athletes are often asked for autographs from fans, but unfortunately, some individuals’ sole motivation in seeking an autograph is for resale," said NCAA Vice President of Academic and Membership Affairs Kevin Lennon after the Manziel ruling. The Manziel ban is the latest decision made about high-profile NCAA players who have had their amateur status questioned during their collegiate days. In 2010, Reggie Bush returned his Heisman trophy, an award given out annually to the NCAA’s best player, after the NCAA concluded he received money from marketing agents while playing at Southern Cal in 2006. Throughout the 2010 football season, Auburn quarterback Cam Newton fought allegations that his father solicited schools for up to $180,000. Newtown served a one-day suspension, but never missed any playing time, going on to win the 2010 Heisman Trophy and leading Auburn to a 2011 National Championship win. NCAA football is now a big money business. According to ESPN, in 2008 the University of Alabama, one of the premiere programs in the NCAA, had profits of more than $123 million, but its players were not able to see any of that revenue. Chris Childers, host of XM Radio’s “College Football Coast-to-Coast”, believes the time is coming for change at the NCAA’s highest level. “I think the NCAA needs to be stopped,” Childers told CNN in a recent interview. “I think the NCAA is so broken, so incompetent. The only thing consistent about the NCAA is its inconsistencies. “The school athletic departments are making a killing. The NCAA is making a killing. The schools at large are making a killing. With the NCAA unwilling to adapt, will changes be forced upon it? “I think times have changed," answered Childers. "They are so stubborn with their old rules and the way they conduct themselves the hypocrisy is unbelievable. What Childers is talking about would be total cost of the tuition system, where players would receive a set allowance to give them money to spend outside of their classroom expenses. However, the NCAA is not in favor of implementing such a system, according to NCAA Vice President of Communications Bob Williams. “As a membership association, our members have not supported the professionalization of college athletics,” Williams said in a statement to CNN. Williams says the NCAA gives 96% of their revenue directly back to the schools, and thus the student athletes, to generate more than $2 billion in athletic scholarships. These are the same contracted scholarships that restrict the student athletes financially and prevent profiting from their own success. While there have been many options thrown around to solve the growing “amateur” problem in NCAA football, one thing is for certain - there needs to be a solution soon before the there is an English Premier League like move away from the NCAA. 'The NFL has cemented itself among the popular sporting leagues in the world' This must have been written buy an american.... Other than on military bases the most popular US sporting events worldwide are The Masters, The US Open golf and tennis and the Kentucky Derby.